Don't know where to begin? 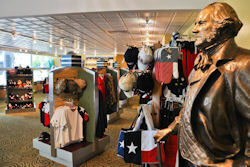 Start at the City of Houston Visitors Center for hundreds of ideas on enjoying your time in Houston. The staff can help you plan your visit, suggest new things to do with your evenings and weekends (even to City residents) or help you bring your convention or meeting to this exciting city. You can reach the GHCVB at 1.800.4.HOUSTON or online at www.visithoustontexas.com. HOURS: Monday - Saturday, 10:00 a.m. to 6:00 p.m.